I remember when I was learning to knit socks, I tried double pointed needles and it was kind of miserable. 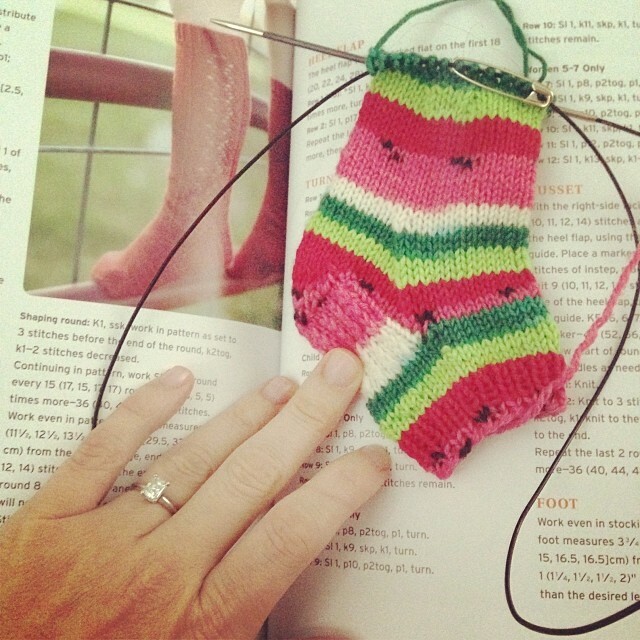 Sometime later I found a little booklet at a fiber festival, it was a guide to creating socks via Magic Loop – if you tune in to Knitting Daily in January you will be able to see how I magic loop! This was a life changer for me, I knit almost everything on circular needles even if I am knitting it flat. I knit everything in the round. When I am knitting a hat instead of using a circular needle smaller then the size of the hat, I just use a 40″ circular needle and knit the hat magic loop style, this means I never have to switch to double pointed needles, I can work all the way down to 8 stitches or less! So I pretty much knit all of my socks this way, and when I wrote my book Just Like Me Knits, I made every effort to create sock patterns that would be needle agnostic. This means the pattern could be knit magic loop, on 4 needles or 5 needles. Speaking of sock patterns from my book, I love a classic sock with a heel flap and the Samantha Socks if you remove the lace panel and leg shaping is pretty much exactly that! So I find myself opening my book quiet often to refer to the numbers for the cast on (which is the total stitches given in the pattern once the leg shaping is complete) and then of course for the heel and gusset. The pattern has all the sizes I will need to knit socks for my kids until they are up to my shoe size, so basically I will be wearing my copy out because I plan to knit lots of socks! The Yarn Harlot and Susan b. Anderson are onto something, socks are one of the most rewarding things to knit aside from a hat. Incredibly useful and warm, and don’t take nearly as long or as much yarn as a sweater! I found this wonderful watermelon sock yarn (self stripping!) via Susan’s blog, and put in an order on etsy. I’ve been delighted with it. Not only did I get a full size adult sock out of it with a normal size ankle/leg, but I even had enough leftover to knit some tiny ones for LG because she was quiet taken with the adult pair (which are going to be gifted). 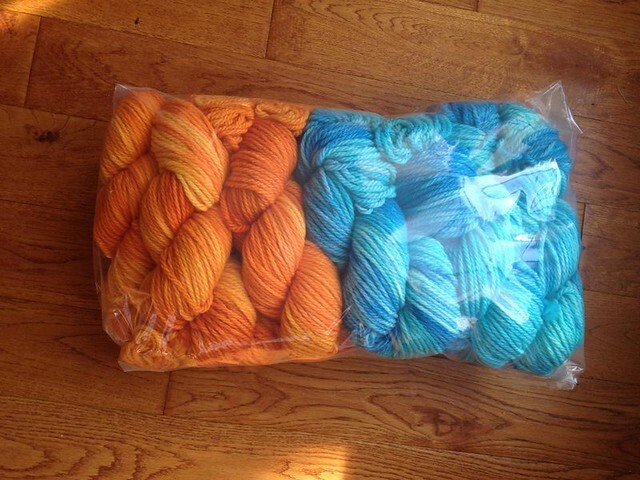 I’m also excite about this amazing yarn from Fable Fibers which was custom dyed (sqeee!) for a particular project I had in mind.